Travel guides on smartphones and tablets (like iPad) present an nice example of some of the richly flexible kinds of pricing behaviors that become feasible with FairPay, the radically adaptive pricing process. 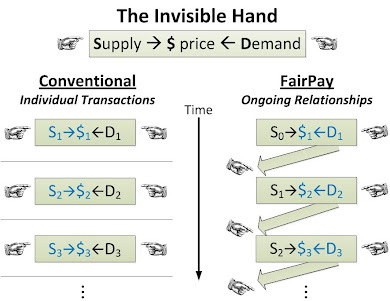 I call this FairPaynomics because of the interesting business and behavioral economics issues it creates. One aspect of FairPaynomics is how FairPay can enable nearly unlimited access to content from varied sources, while giving the providers of that content reasonable compensation for the value they provide. The following example suggests the sophistication that advanced uses of FairPay can provide. A recent article on travel guides for iPads triggered some thoughts on how app stores and e-book vendors could provide new services for buyers, and expand revenues for guide publishers. It points out how guide pricing is a challenge, and how the market is changing from print to mobile. It also noted some limited moves toward slicing and dicing guide content with PDF chapters. The challenge in pricing travel guides is that different readers get very different levels of value, so set prices may be too high for some potential users and too low for others. What if I could have access to many guides, and pay based on the use I made of them? It is impractical for sellers to set prices on such a flexible basis, but relatively easy for me to do so (on an intuitive basis, aided with reference to detailed usage data). Consider the range of situations for using a guide. On some trips I might spend a week or two in one large city, acting as my own guide, and want to make extensive use of one, two, or more guide books to plan excursions, consult while sightseeing, select hotels and restaurants, etc. On a return trip to the same city some years later, I might not need nearly as much help. On a far-away small-ship cruise, I might stay a few days in two terminus cities, plus have day stops in half a dozen small towns in as many as five or six countries along the way (some with guided tours, some on my own). On that cruise trip I might want limited use of one or two guides for each of the countries visited, even though some small ports might have little or no coverage. Paying a set price for each guide as usually packaged creates significant dis-economies. For my multi-country cruise, buying even a single set of guides to all cities/countries visited is a poor value proposition (well over $100), so I might not buy any. For the single-city first visit, paying maybe $10-40 for one or two guides is reasonable, even a bargain. I probably end up paying less than I would be willing to pay in both extremes. I might be willing to pay more than the set price of the guides for intensive use, and I would pay something more than zero for light use of many guides. Under conventional pricing, I suffer and the publisher(s) suffer. So how is FaiPay better? Obviously it would be difficult for a publisher or even a full-service bookseller like Amazon or B&N to set multi-factor prices that worked for such extremes of usage. 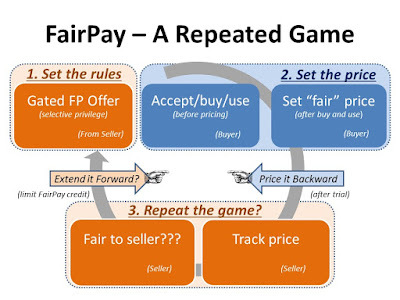 The beauty of FairPay is that they don't have to -- I would set the price. Knowing the list price of guidebooks, I might feel that I am willing to spend $20-40 per week, if I am using my guide(s) heavily, and less if not. I might go higher if covering a lot of cities, and lower if just in one place, and higher if the places are covered in depth, less for small towns with little or no coverage. If I used multiple guides, I would want to divide my payment based on which I used most and which were most valuable (such as tipping me off to good "finds"). How can this work? I would not mind if the sellers had meters that recorded my usage, but I would be put off by knowing that there are set charges per page or minute of viewing, with a meter going ka-ching. I would be OK with such metrics of usage as suggestive of what I should pay, but not as a ticking meter of set charges. 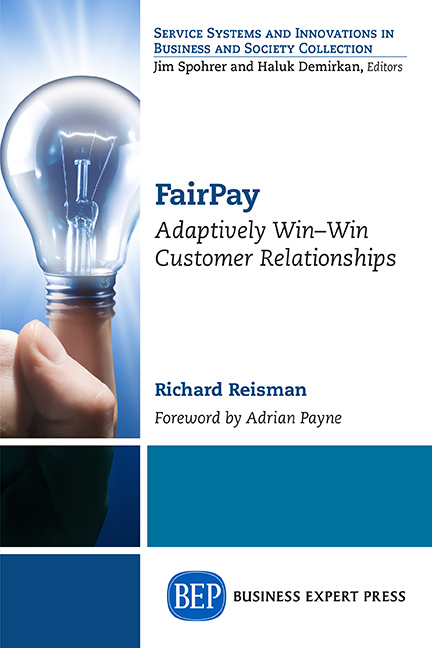 With FairPay, I could have it my way. Amazon or B&N (or Apple or Sony, or whoever) could administer the store, collect the metered usage data, and let me pay as I see fit. As long as I paid at reasonable levels (considering my usage), they would continue to let me get more guides (for my next trips) on a FairPay basis. If I did not pay well, they would cut me off and it would be back to the old way. For my return trip to the big city, they might offer use of an updated guide, and expect only modest payment, resulting in another win for both me and the sellers. Good for me, some work for Amazon or whoever, but do-able -- but is it good for the publishers? Overall, they might do much better. I would have only bought one or two guides conventionally, for $10-40, so under my FairPay allocation, I might pay $20-40 to those one or two publishers, and so the second might have a sale he would not have gotten. But I would have used other guides in those places as well, and paid something to those publishers, as well. I also would have used guides at various cities on the cruise trip, and paid for the moderate level of usage that was foregone because I did not want to buy guides I would use only lightly (maybe paying $20-30 for those as well). Also, I would feel much better about being able to use and pay for guides accessed my way, not the way the publisher pre-packages them into "titles"that don't fit me, and so would be willing to pay at higher levels. The publisher and the store would get more from me, and I would be much happier about the fairness of the value exchange. The bottom line nearly ideal Internet economics. I get access to all the guides I feel I have use for (exploiting their near-zero marginal cost), and pay based on how I use them (based mostly on my intuitive allocation of value, grounded in the reality of usage data). The publisher can sell to anyone who has use for the product, and get revenue commensurate with that use. Doing that with conventional pricing models would be impractical, and the ka-ching of a ticking usage meter would put a damper on the kind of casual use that, with FairPay, might result in added revenue (after the fact, when the value was known). This may sound utopian, but the Internet enables many utopian capabilities. Think about it. It can work. How do you take into account uses that occur later (sometimes long time after the purchase) : for example, the travel guide that I eventually use a lot two years later when I decide to spend several weekends in a given city, or the movie I watch with ten friends one year after enjoying it alone ?